As many of you know I am traveling right now, and as some of you know I am in Bangkok. 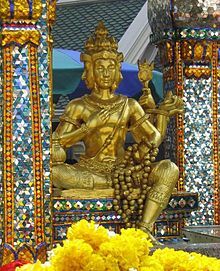 My friend sent me a note via Facebook on Monday, asking, “Are you ok, were you anywhere near the bomb blast?” My friend’s comment was the first that I had heard about the bomb blast at the popular Hindu Erawan Shrine to Brahma, in Central Bangkok yesterday (August 17th). At the time of the blast my husband and I were on our way to dinner about half a kilometer away. My husband remembers seeing a flash of light down the street as we entered the up-scale mall at Central Chitlom. The flash lasted only an instant … with all the lights and marketing gimmicks going on in Bangkok, the flash was no surprise to the people around us. They (and we) all went on with walking and talking, when only moments later there was a huge loud bang. Harold did not connect the flash and the sound as related. As for me—not knowing what Bangkok sounds like, the blast was just part of the ambient sounds of a huge ‘over-populated’ city. An hour later (after dinner) we took the sky train home and had a bird’s eye view from the Chitlom sky train platform. I notice that the already over-busy traffic intersection of Phloen Chit Road west of Langsuan Road was jammed with the flashing blue and red lights of police cars. We are quite safe and sound where we are, and I am not worried. As for my experience here and now in Bangkok . . . I am feeling ‘safe’, although there is speculation that tourists are being targeted. I find it interesting that in November of 2012, when I was outside Canada teaching Sacred Sexuality with ISTSA in Israel, a war broke out between Gaza and Israel the day before I left Canada. (A cease-fire was called 5 days after my arrival.) Then too I felt ‘safe’. I am more and more convinced that ‘safety’ is an internal state as well as an external reality. In reality Bangkok is a very peaceful and welcoming city. The people of Thailand are mainly Buddhist—truly kind and obviously compassionate—and the horror of violence and unexpected loss of lives in this recent bomb blast is not a reflection of the whole city (nor of the country) any more than is the experience of violence in large cities in every country (whether due to family violence, bullying, corruption and crime, social conflict, political factions and social unrest). Risk verses Safety is more the landscape that comes with living in a world full of radical discontinuity and accelerated change. And from my experience in traveling, these kinds of incidents allow us to come together in ways that, in the long-term, bring greater clarity, awareness and ultimately, understanding. Please, send prayers to those who are discontent, worried, injured–and for those 22 souls who died, and their family and friends who are shocked and grieving, please send prayers to them as well. I understand what you mean by “safety being a state of mind”. It makes you intuitive and and aware of your surroundings in a heightened state of natural awareness. It becomes the way you walk through the world. Yes, Yve, exactly! Thank you for your comment!